Find answers to your essential ammunition questions and a multitude of others in Choosing Handgun Ammo: The Facts that Matter Most for Self-Defense. The masterfully written reference cuts through the chatter of endless caliber and cartridge debates to deliver the stone cold facts on ammunition with the results of actual testing to back it up. 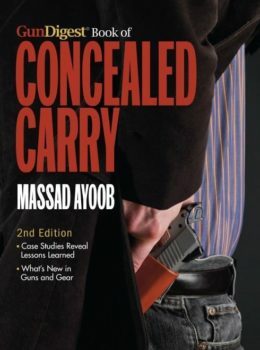 Categories: Concealed Carry, Handguns SKU:: R6058-m Format:Digital Book (PDF), Paperback ISBN: 9781946267030. Have you ever asked these questions about personal defense ammo? * What is the truth about “stopping power”? * How effective are micro calibers? * Who makes the best 9mm? * How does self-defense ammunition compare to other types? If you have, you aren’t alone. And now you can find answers to these essential ammunition questions and a multitude of others in Choosing Handgun Ammo: The Facts that Matter Most for Self-Defense. The masterfully written reference cuts through the chatter of endless caliber and cartridge debates to deliver the stone cold facts on ammunition, with the results of actual testing to back it up. Author Patrick Sweeney delivers a graduate course in defensive ammunition in this comprehensive resource, walking you through both the philosophy and science of this serious subject. From breaking down the rigors of F.B.I protocol testing to busting ever-present and dangerous myths concerning self-defense ammo, the master gunsmith gives you a firm handle on what makes a solid and dependable defense round. Then he takes you into the ballistics lab to figure out which ones truly cut muster. From the demure .380 ACP to the behemoth 10mm, Sweeney pounds ballistic gelatin and measures bullet velocities and energy to reveal the true performance of defensive ammunition options. If you’ve ever wondered what ammunition to feed your concealed carry .45 ACP or how the .357 Magnum honestly stacks up, Choosing Handgun Ammo: The Facts that Matter Most for Self-Defense is for you. You and your loved ones will sleep better knowing you’ve loaded up on this vital information. and Gunsmithing the AR-15 Vols. 1 & 2.